VS Sassoon launches the holy grail in styling. The total protection ceramic intense dryer and straightener. Developed with the latest new-gen technologies, these salon styling tools will help you create all the newest styles and looks easily and quickly at home all while leaving your hair soft, shiny and totally protected. If you are looking for Total Protection and Total Control, and a glam hair dryer that will make it easy to achieve a salon finish, then this Salon Professional AC Dryer from VS Sassoon is a must-have. It will help you achieve all the latest looks, from the current -I've barely touched my hair' styles to those high-glam awards season looks that caught everyone's attention in the last couple of weeks. It's a salon dryer that delivers professional, versatile results even if you aren't a professional. So how does it work? For a start, it's equipped with high-density ceramic intense technology and a high velocity professional AC motor, which together deliver professional drying speed and even heat distribution to guarantee soft, shiny undamaged hair. Complete with a super slim concentrator (for even more control), an extra-large diffuser (for softly drying natural curls) & a round thermal styling brush this dryer package has everything you need for a professional blow dry at home. Ceramic Intense Technology to help maintain even heat during drying. Ionic Conditioning Technology™ to condition the hair to reduce static, leaving hair silky and shiny. 3 heat & 2 speed settings for variable styling control. True cold shot button to set the style. Removable rear filter for easy cleaning & maintenance. VS Sassoon Total Protection Ceramic Intense Salon Professional AC Dryer: RRP $62.95 3 year Warranty. A good quality straightener goes a long way and who doesn't love protected, smooth, shiny healthy hair without the frizz? This Salon Professional Straightener from VS Sassoon features Ceramic Intense Plate Technology and CeramicTEC heating technology meaning that you (and your hair) will be enjoying all the very best protective and heat transfer properties that professional ceramic has to offer. Most importantly, with this astonishing new straightener you can get fast, long-lasting results and hair that is silky and shiny. Use it straighten, curl and wave quickly and expertly. Ceramic Intense Plate Technology features high-density ceramic for the perfect glide and heat transfer properties to guarantee softness, shine and protection of your hair. Ionic Conditioning Technology™ for supreme shine. LCD variable temperature control from 130°C to 230° making it even easier to pick the best setting for your hair and style. 230°C intense heat button so you can create perfect runway looks – FAST. Floating long slim plate for increased control even on larger sections. Cool touch tip for comfortable control and to protect fingers. Professional salon length 3m swivel power cord for easy styling. Luxury heat resistant fold out pouch - great for storage and protection of your vanity units (it's not just your hair that needs protecting). 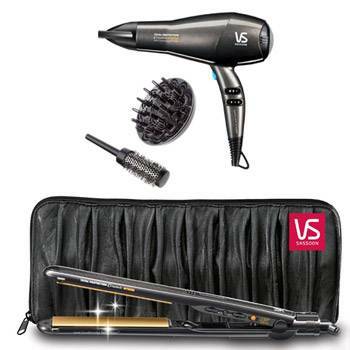 VS Sassoon Total Protection Ceramic Intense Salon Professional Straightener: $132.95 3 Year Warranty.